Authors: Libin P, Beheydt G, Deforche K, Imbrechts S, Ferreira F, Van Laethem K, Theys K, Carvalho AP, Cavaco Silva J, Lapadula G, Torti P, Assel M, Wesner S, Snoeck J, Ruelle J, De Bel A, Lacor P, De Munter P, Van Wijngaerden E, Zazzi M, Kaiser R, Ayouba A, Peeters M, de Oliveira T, Alcantara L, Grossman Z, Sloot P, Otelea D, Paraschiv S, Boucher C, Camacho R, and Vandamme AM. Summary: RegaDB is a free and open source data management and analysis environment for infectious diseases. RegaDB allows clinicians to store, manage and analyze patient data, including viral genetic sequences. Moreover, RegaDB provides researchers with a mechanism to collect data in a uniform format and offers them a canvas to make newly developed bioinformatics tools available to clinicians and virologists through a user friendly interface. Availability and implementation: Source code, binaries and documentation are available on http://regaweb.med.kuleuven.be/software/regadb/ RegaDB is written in the Java programming language, using a web-service oriented architecture. Opportunities for researchers: Another example of the utility of RegaDB is the collaborative database used within the Southern African Treatment and Resistance Network (SATuRN). This network has 24 member institutions working in Southern Africa, the region at the epicenter of the HIV epidemic. Currently there are more than ten institutions using the SATuRN RegaDB for patient data management, data curation and research. Under SATuRN, more than 7,000 genotypes with treatment and monitoring data has been collected. Using the built-in customized report and query functionality, data of specific attributes is selected, analyzed and used to answer specific clinical and research questions (Manasa et al. 2012, de Oliveira et al. 2010). In addition, members of the SATuRN project recently published a book (Rossouw, Lessells & de Oliveira 2013) containing a series of case studies used for training. 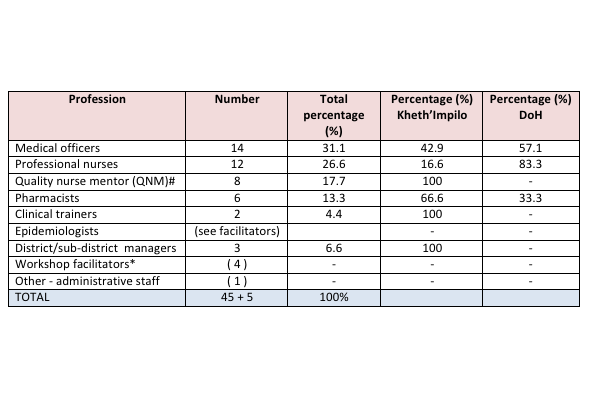 More than 1,450 physicians and nurses have been trained through conferences, workshops and online web-tutorials RegaDB: Community-driven data management and analysis for infectious diseases. Citation: Libin P, Beheydt G, Deforche K, Imbrechts S, Ferreira F, Van Laethem K, Theys K, Carvalho AP, Cavaco Silva J, Lapadula G, Torti P, Assel M, Wesner S, Snoeck J, Ruelle J, De Bel A, Lacor P, De Munter P, Van Wijngaerden E, Zazzi M, Kaiser R, Ayouba A, Peeters M, de Oliveira T, Alcantara L, Grossman Z, Sloot P, Otelea D, Paraschiv S, Boucher C, Camacho R, and Vandamme AM. RegaDB: Community-driven data management and analysis for infectious diseases Bioinformatics,29 (11):1477-1480, doi: 10.1093/bioinformatics/btst162 (2013). Organised by the Africa Centre for Health and Population Studies and Southern African Treatment and Resistance Network (SATuRN) in collaboration with the uMkhanyakude District Health Office. This workshop is aimed at developing knowledge and skills around the prevention and management of drug resistance and treatment failure in both HIV and TB. 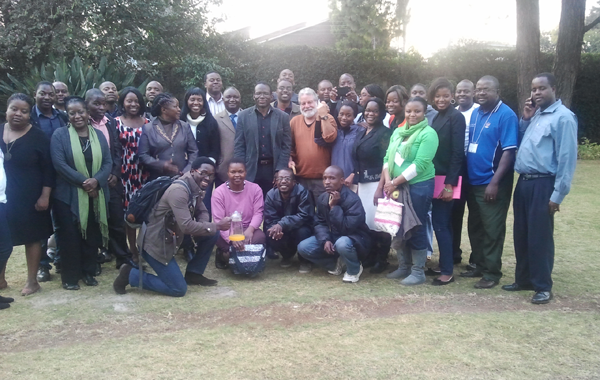 HIV and TB: Drug Resistance and Clinical Management Case Book - a book co-authored by two academics from the Africa Centre for Health and Population Studies - has been presented to frontline health workers at a workshop in northern KwaZulu-Natal. By Sanku Tsunke, Pretoria, 19 March 2013. Drug resistance is one of the main challenges confronting HIV and TB programmes in Africa. Facing these challenges requires an understanding of how drug resistance develops, as well as up-to-date knowledge of how to diagnose and manage drug resistance in HIV and TB patients. Weerstand teen medikasie is een van die belangrikste struikelblokke wat programme om MIV en tuberkulose in Afrika te bestry te bowe moet kom. Om hierdie uitdagings die hoof te bied, word 'n begrip vereis van hoe weerstand teen die middels tot stand kom, sowel as vertroudheid met die jongste metodes om weerstand teen die medikasie in MIV- en tuberkulosepasiente te diagnoseer en bestuur. The 17th Annual Rural Health Conference will be held in St. Lucia, KwaZulu-Natal, South Africa, from 8 to 10 August 2013. SATuRN will have a session (approximately 2-3 hours) in the conference and will distribute the HIV & TB Drug Resistance and Clinical Management Case Book. By Jonathan Davis, 15 April 2013 - Researchers from the Africa Centre for Health and Population Research near Mtubatuba have published a important book to help rural doctors, nurses and pharmacists working on the frontline of the country's interlinked HIV and tuberculosis (TB) pandemics manage increasing levels of resistance to the drugs needed to fight the diseases.